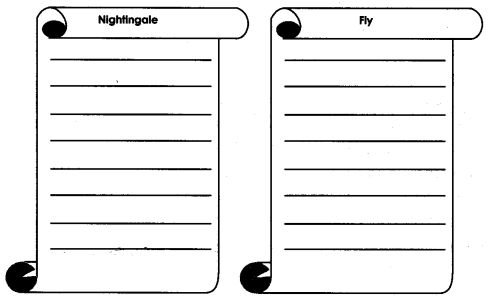 NCERT Solutions for Class 10 English Literature Chapter 7 The Frog and the Nightingale are part of NCERT Solutions for Class 10 English Literature Reader. Here we have given NCERT Solutions for Class 10 English Literature Reader Chapter 7 The Frog and the Nightingale. Have you come across people who are not what they seem to be-like someone who is extremely friendly and helpful yet you are not very comfortable with him/her as you feel it is a put-on ? Have a class discussion about such people and why you feel as you do. Student 1: I know many people who are not what they seem. They use you to get their work done in a very clever way. Student 2: Yes, I also agree with that. My mother is right in saying that excess of everything is bad. So, if we come across a person who is being too friendly with us, we must smell a rat and be careful. Student 3: One of my friends is very helpful sometimes but I never find him too comfortable to be with and sooner or later his real motives are revealed when he asks for a bigger favour in return. Note: Students may extend the discussion on their own. Before you read the poem complete the word-web with the words that we associate with a Frog and a Nightingale. (k) Finally, the nightingale burst a vein and died. I’m the frog who owns this tree In this bog I’ve long been known For my splendid baritone. Nightingale Did you…did you like my song? Frog Not too bad – but far too long The technique was fine, of course, But it Icfcked a certain force. Frog Without proper training such as 1 And a few others pan supply You’ll remain a mere beginner. But with me you’ll be a winner. Nightingale But 1 can’t sing in this weather. Nightingale …This is a fairy tale – And you’re Mozart in disguise Come to earth before my eyes. Frog Come, my dear – we’ll sing together. Frog We must aim for better billing You still owe- me sixty shillings. Frog Brainless bird – you’re on the stage Use your wits and follow fashion. Frog …1 tried to teach her. Divide yourselves into groups of four or five and brainstorm on any one of the given situations in order to create an imaginary dialogue or a comic strip. Keep in mind the characters and situations while doing so. Representatives from each group could then present the dialogues/read them to the class. Duck: Oh! what a cacophony! can’t he be quiet? Heron: (shouting at frog) You loathful fellow! Don’t torture us with your crass behaviour. Nightingale: Oh! what a beautiful evening let me rest here for sometime and sing a song. Frog: Eh! who is this singing here in my territory? Nightingale: Umph! It’s me, the nightingale. Duck: lovely song! you are welcome here in the bog. Heron: Oooh! we’ve never heard such an enthralling voice before,. loon: (shedding tears of joy) “unbelievable”. Toads: Hush! sush! let’s listen to her. She sings so sweetly. Frog: Croak-Croak- Don’t you know that I am the owner of this bog and only I have the right to sing here, humph! (c) Nightingale was ready to sing when she heard a croak. Nightingale : (timidly) : Is that you who is croaking? Who are you? Frog: (vainly) Croak! Croak! Don’t you know, I am the unrivalled king of this bog? Nightingale: Oh! It’s my pleasure to meet you. Do you like my song? Frog: Hmm! It’s O.K. but you lack technique. I am famous for my baritone. (d) One morning it was raining and as usual, frog started training the nightingale. Nightingale: Boom! I can’t sing in this chilly weather. Frog: Be brave! You silly bird. Just put on your scarf and start singing. Nightingale: I’ll try-koo-Oh-ah! Ko-ash! Ko-ash!” Oh! I’m feeling totally drained out. (e) The strenuous and gruelling schedule of singing had its effect on the nightingale and her song lost its charm. Frog: Oh! people are no longer interested in coming to listen to the song. It’s a great loss to me. Nightingale: Aha! you selfish frog. Can’t you see my woeful countenance? I can’t sing any more. Frog: What! Croak! Croak! How can you say that? Sing with energy and passion. Students are free to complete the conversation on their own by using these hints. On the basis of your understanding of the poem, complete the sentences given below by choosing the appropriate option. (d) make a lot of money. (a) The nightingale was sorrowful and pale because she………………..
(c) She no longer enjoyed singing alone as…………………..
(ii) she was now used to the appreciation she got . (a) How did the creatures of Single bog react to the nightingale’s singing? The creatures of Bingle Bog appreciated the sweet voice of the nightingale. Every one clapped for her generously. All the animals gathered around the sumac tree. Ducks and herons waded through water and reached where nightingale was singing. The frog does not appreciate nightingale’s song when all the creatures of the bog like her voice. He introduces himself to the nightingale as the owner of the tree, the writer and critic, and the best singer. He also offers himself to train the nightingale in singing and charges a high tuition fee. He makes her to give musical concerts and charges entry fee. He compells her to give performances and take music lessons from him. (c) Why is the frog’s joy both sweet and bitter? The frog’s joy is sweet because he was making a lot of money on the talent of the nightingale and earning a good business. But his joy turns bitter because he became jealous of the nightingale’s popularity. The frog was angry because he lost his business and money. He blamed nightingale for this loss. The frog snubbed nightingale for not performing well. She did what the frog asked her to do. .She overstrained herself, a vein burst, she died. The frog became unrivalled king. Discuss the following questions and write the answers in your note-books. (a) Bring out the irony in the frog’s statement—‘Your song must be your own’. When the nightingale said that her song was her own, the frog remarked that she should , not boast about that and gave lessons to improve her. Later when she died, frog hypocritically stole her statement and told the audience that he taught her to be original in her song. No, the end is not justified because the revenge of the nightingale’s ruthless killing could not be taken as nobody could know frog’s reality. (c) Do you think the nightingale is ‘brainless’ ? Give reasons for your answer. Yes, the nightingale is truly brainless because she could not understand the crafty scheme of the frog. let herself be dominated by the frog, trusted him blindly. was not confident about her talent, relied on frog. was easily influenced by him and died of her own foolishness. (d) In spite of having a melodious voice and being a crowd puller, the nightingale turns out to be a loser and dies. How far is she responsible for her own downfall? have been aware of the behaviour of the frog towards her. Had she been confident about her talent and worth and not have followed the frog blindly, she could have saved herself and emerged as a successful singer. She is largely responsible for her own downfall and tragic death. (e) Do you agree with the Frog’s inference of the Nightingale’s character ? Give reasons for your answer. No, I am not completely convinced by the inference that the frog has about the nightingales character. The nightingale is, in reality, a gullible bird but the frog portrayed her as a greedy and untalented bird. She won over the heart of her audience time and again with her original lyrics and compositions whereby the frog charged her with being stale. She was much better a singer than the frog but he made her take lessons from him. The frog presented the nightingale exactly the opposite to what she really was. How a person tries to put down another when that person is succeeding in his or her life. Our self-image is often b&sed on what others make us believe we are. A poor self-image can do irreparable damage to us. Do you agree with this statement? Elaborate with suitable reasons and. examples. In today’s ‘fast food’ world, people want everything in the wink of an eye. They chase after unmaterialistic goals and end up wasting their precious time and energy But in my opinion, to be successful in life, the quality of perseverance plays an important role. Success requires a person to accept responsibility and thinking that you will get success instantly is nothing but foolishness. Always remember that everything comes at a price. Passion, perseverance and perfection are the things that ensure success to a person. There is nothing like ‘Instant success! In order to reach the highest level in any of the thing, proper practice and training are must. But unfortunately, modern society is incredibly impatient and want everything overnight. They must relax and take their time to get the results of their endeavours. A sustained but continuous effort is sure to give you good results. A poor self-image can do irrepairable damage to us. I fully agree with this statement and want to put before you a very wise quote by Albert Einstein. ‘Everybody is a genius. But if you judge a fish by its ability to climb a tree, it will live its whole life believing that it is stupid. We often tend to fear “what do people think about us? This fear influences our personality to a great extent and we form an opinion of ourselves based on what others make us believe we are. Children are especially vulnerable to accepting criticism and suffer from poor body image issue. They are always nagged by fears like – “Are they laughing at me!’ ‘I’m good at nothing’, I can never be of any use to anybody.’ But these are destructive thoughts that result from a feeling of low self esteem. My advice to you is to stop hating yourself and forgive yourself for your mistakes. Nobody has the right to challenge your self-esteem. It’s your ownlife and you must line it your own way. Be the change and show the world. How lonesome and tired I am feeling! Today what I am, is a result of my short-sightedness. I was foolish enough to believe the scheming frog. Whatever he said, I accepted without questioning and could not see his real motives. Anxious to get instant success, I have brought ruin upon myself. I set unrealistic expectations for myself and failed to realize the implications of my actions. The frog was very cunning and befool me easily and exploited me till the end.Now, I repent my haste as even the audience, who used to listen to my songs with delight, have dwindled. I am a failure. How I wish 1 would have assessed myself accurately and acknowledged my strengths and weaknesses. Write an obituary for the nightingale. You may begin like this : May the kind soul (or you may make use of your own beginning). May the kind soul rest in peace. How sweet and innocent was she when she first came here pleasing us all with her melodious voice. She was too innocent to understand the vile intentions of the sly frog. Few moments ago, she was flying and singing like she always wanted to. Now, she’ll sing forever in the kingdom of God. Listen to a poem on a similar theme by Mary Howitt and compare the Fly to Vikram Seth’s Nightingale. 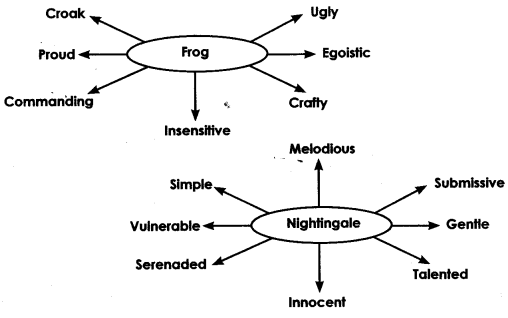 We hope the NCERT Solutions for Class 10 English Literature Chapter 7 The Frog and the Nightingale help you. If you have any query regarding NCERT Solutions for Class 10 English Literature Reader Chapter 7 The Frog and the Nightingale, drop a comment below and we will get back to you at the earliest.